On Saturday 9th April 2011 my family and I set off from Saltburn-by-the-Sea to walk 75 miles along the Cleveland Way to Helmsley and on to Pickering. This was a sponsored charity event to raise funds for The SMA Trust, of which I am a trustee, and in memory of our eldest son Harry, who died ten years ago of the genetic condition Spinal Muscular Atrophy for which the charity funds research. The website www.madchallenge.org has all the details and anyone can join a team, start their own challenge or simply donate to one of the teams. We were started off in great style by the Cleveland Concert Band, who turned out in force, which in turn got some publicity going and Tyne Tees TV did an ‘and finally’ slot on the local news on the Saturday night. I did a live radio interview just before we set off and a photographer from The Northern Echo turned up as well – they did a nice piece in the paper. Marni Smyth, our challenge team captain, and Cath McNicol set us off in their wheelchairs, as well as an SMA family from Newcastle and one from Edinburgh! The latter were keen to come as they see very little research activity anywhere, which is something we aim as a charity to capitalise upon. Day one was relatively easy until the last two miles, when dissention in the ranks could be heard. Cam as ever had headphones on and was driven along the way by Dubstep beats. We stayed in a YHA camping barn which was, shall we say, basic. It was the only night we needed sleeping bags, but we still had to carry them all the way. Then off onto the open moors the next morning to Chop Gate – a beautiful day requiring sun cream in April! That night’s overnight accommodation turning out to be a mile and a half further than anticipated. However it was definitely worth it as the farm was in full lambing season and foaling mares abounded – Emily was in her element and delivered five lambs before dinner that evening (in case you’re asking, we ate pork that night!). Day three (our longest distance) was a struggle, especially when it poured for a couple of hours, but apart from that we managed quite ably to get to Sutton Bank before dark, passing some of the most stunning countryside and historical sites along the way. A huge meal at the Hambleton Inn was very welcome, as was the discovery that behind the pub were two racing stables – Emily again couldn’t believe her luck, especially when 15 racehorses from Kevin Ryan’s stable were obligingly exercised in front of us on Tuesday morning. Passing Rievaulx Abbey that morning was a treat, although with no time to stop it was only a fleeting glimpse. Dropping down from the moors into Helmsley was so satisfying, arriving in the market square for lunch, before setting off again for the final leg of the challenge. We were joined for part of this by Julie and Evie Smyth, who were great company as we finally arrived, elated by the effort, in Pickering. 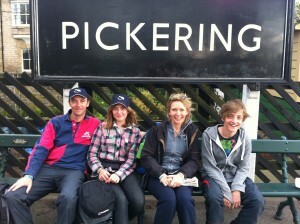 A few photos under the North York Moors Railway sign and that was it – all done! Well, apart from the 200 mile drive to get back home to a hot bath and a long sleep. So, what’s the next challenge? If you aren’t already actively engaging with more than 600 million Social Media users then you should attend my two-hour ‘Effective Social Media‘ seminar and learn how to leverage LinkedIn, Facebook, Twitter and other social networks for your business, organisation or charity. 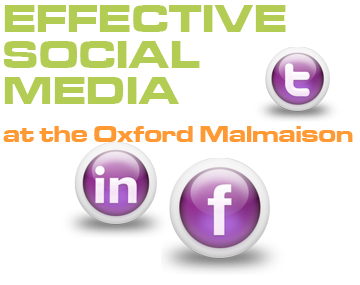 The seminar aims to give attendees a solid foundation in the world of Social Media, using interactive sessions and discussion on the social networks that organisations should be using in their marketing mix. Delegates will come away with an understanding of how to plan and manage their digital network communication. The next event is scheduled for 20th May. If you are interested in attending, please contact me or book a place here.